The Sword of Damocles hanging over the company's proverbial head may have been removed. Also, third-quarter results were quite nice. What: Shares of Lifelock (NYSE:LOCK) jumped more than 40% higher on Thursday. On Wednesday night, the provider of identity theft services and other risk management products reported strong third-quarter results, padded with an unrelated but equally important piece of good news. 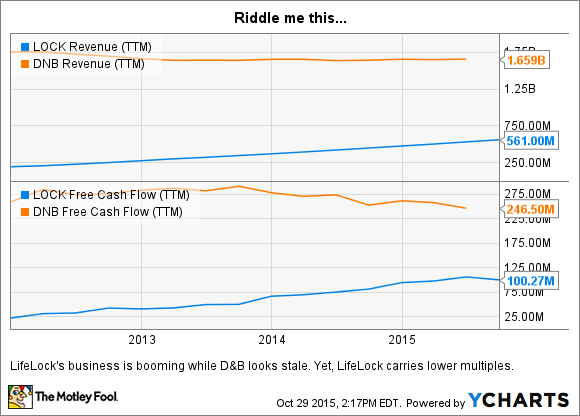 So what: In the third quarter, LifeLock's sales rose 24% year over year to land at $152 million. On the bottom line, the company recorded a GAAP loss of $0.68 per diluted share, compared to a $0.06 GAAP profit in the year-ago quarter. Note that this quarter's income calculations include a $96 million expense line to account for the potential damages in a high-profile legal action. And that's where LifeLock's other good news comes in. The company has reached an agreement with the Federal Trade Commission, which will put a favorable official recommendation in front of the commission and federal courts. If approved, which is likely once you have reached this stage of negotiations, LifeLock will be off the hook for those potentially crushing legal fees and can retire that line item. Seen from that angle, LifeLock reported adjusted earnings of $0.28 per share, nearly double the $0.16 adjusted profit per share in the year-ago period. Now what: LifeLock made it clear that the agreement still must get some official FTC nod and gavel bangs, but neither court officials nor commission committees are in the habit of ruling against these deeply researched staff recommendations. That being said, there's a decent chance that the process could tack on some concessions for LifeLock to follow, and in that case probably related to the "truth in advertising" principles the company was accused of ignoring in the first place. So, assuming that the FTC investigation has effectively ended without LifeLock paying any million-dollar court-ordered damages, investors can go back to analyzing this stock in the light of operating results instead of legal albatrosses. From that angle, you're looking at steady annual sales growth of roughly 25% on top of suddenly secure positive earnings and healthy cash flows.